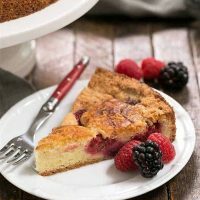 This super easy, moist Mixed Berry Torte, is equally as wonderful served as a coffeecake in the morning or a simple dessert after your evening meal! Plus, it’s terrific with all sorts of fruit! Adapted from Marian Burros, this basic cake recipe lets the berries shine! For a food blogger, I’m a bit out of touch. Apparently, the inspiration for this recipe appeared year after year in the New York Time’s cooking section. 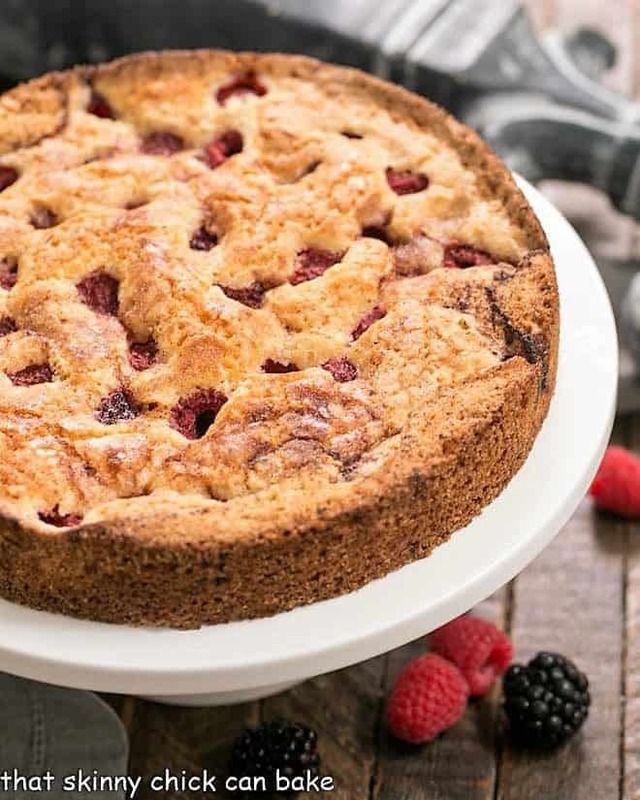 This featured torte recipe was made with 24 purple plum halves, but folks across the world successfully tweaked it using berries, peaches, apples and more. One September, the recipe was not printed and the plum torte fans revolted! A girlfriend brought her version to our knitting group and the whole room had a faint aroma of cinnamon and butter. I knew I’d have to look up the recipe. As I mentioned above, this torte can be made with a variety of fruits. Purple plums may not be in season or available in your region, so it’s nice to have alternatives, like using a couple different berries. Replace the plums with 3 cups of fresh berries, like blueberries, raspberries, blackberries or a combination. If your fruit is super sweet or you want to serve this for breakfast, feel free to decrease the sugar from 1 cup to 3/4 cup. Around the holidays, use cranberries and add some orange zest, too. Since cranberries are tart, I’d suggest using a full cup of sugar. Even canned fruit will work well, especially mid winter when there are no fresh peaches, apricots, etc. in season. Using the best quality fruit available will make for the most delicious results. I tried mixing the berries into the batter, but being fragile, they bled and discolored the mixture. The taste was fine, but I much preferred sprinkling them over the batter. I added vanilla to my batter. A touch of lemon extract would be lovely with blueberries, almond extract with apricots or peaches, etc. Simple recipes need quality ingredients. Use the best butter you can find, a good quality vanilla extractand top notch fruit. I baked my torte in a 9-inch springform pan for 1 hour. If you use an 8-inch pan, you’ll need to bake a bit longer and if you use a 10-inch pan, it may take less time in the oven. Use a toothpick to check the center for doneness. It should come out clean after insertion. This mixed berry torte will definitely grace our table again. I told Bill it was a coffeecake, and he happily ate slice after slice until it disappeared. We’re both fans of berry recipes like this Lemon Blueberry Muffin Bread, this Strawberry Topped Chocolate Tart or how about these Cranberry Cream Cheese Bars??? 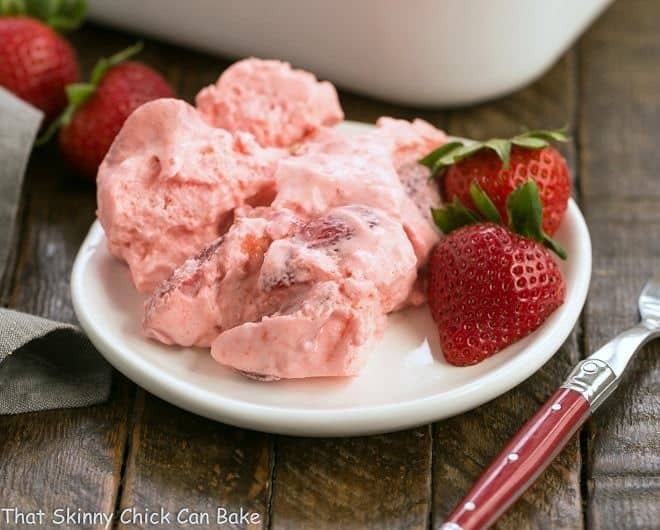 Homemade Strawberry Shortcake is a MUST during berry season. This Berry Mascarpone Layer Cake definitely caught my attention, as did this magnificent Mixed Berry Crumble. 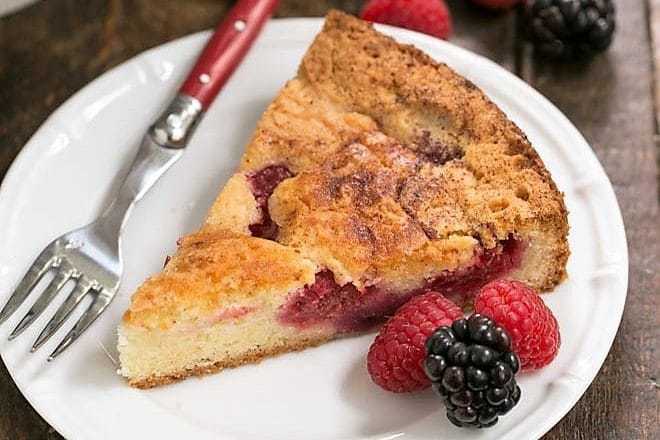 A simple berry torte that’s always a hit! Cream together the sugar and butter. Add the flour, baking powder, salt, eggs and beat until well combined. Stir in the vanilla. Spread the batter into a greased 9-inch springform pan. 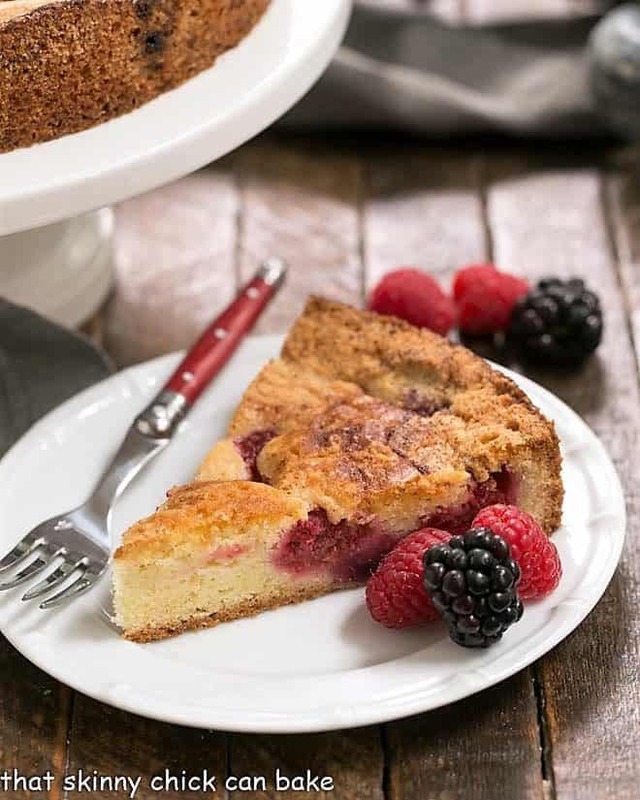 Top the batter with berries, then sprinkle lightly with cinnamon, sugar and a drizzle of lemon juice..
Bake 1 hour or until a toothpick inserted into the middle of the cake comes out clean or with a few moist crumbs. 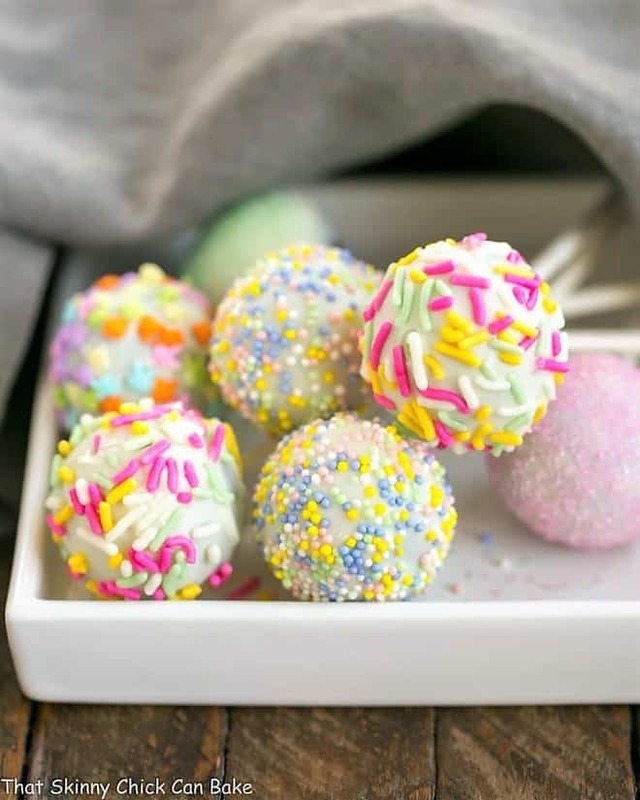 Serve with a dollop of sweetened whipped cream or a dusting of powdered sugar. That looks lovely and I can try this when I see berries on special offer at the local supermarket. I love berries but they cost a fortune over here. Looks good enough to eat, Liz. Yum. I love having simple but delicious recipes like this stashed away. Thanks, Liz, it looks like a winner! Love the ease of preparation and how delicious and beautiful it has turned out! Oh, I love this and will keep it for next summer when the blackberries are ripe and fresh. Sounds and looks delicious, Liz! Thanks for the recipe and have a good week! It definitely looks like a lovely cake for any time of the year. The berries must have been delicious. I’ve made something similar with sour cherries, plums and apples, they are all winners in my books. 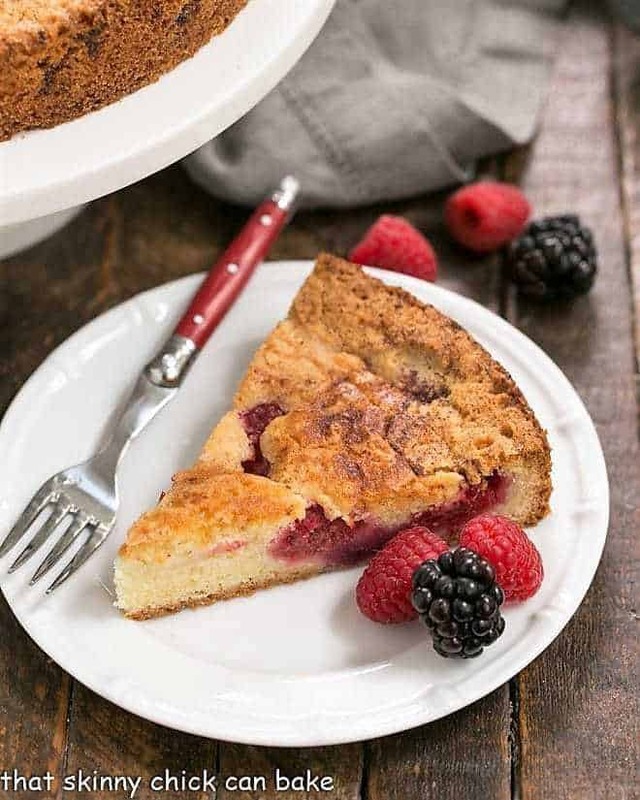 Liz, this fruit torte looks wonderful and I love the idea that it is very easy…so versatile as any fruit can be used…thank you so much for sharing the recipe…have a wonderful week! 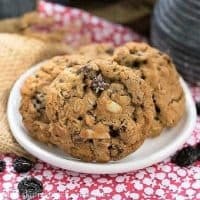 I’m always out of the loop on the New York Times recipes! I don’t know why, I’m obviously missing out on deliciousness, but I also miss the boat. This looks amazing — I’m excited to (finally) try it! Thanks, Liz! One can never have too many berry recipes. Looks like I’ll have to add this to my bunch. Thanks Liz! 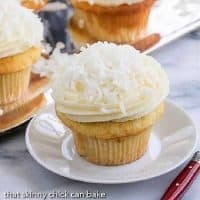 Such an easy and delicious dessert! 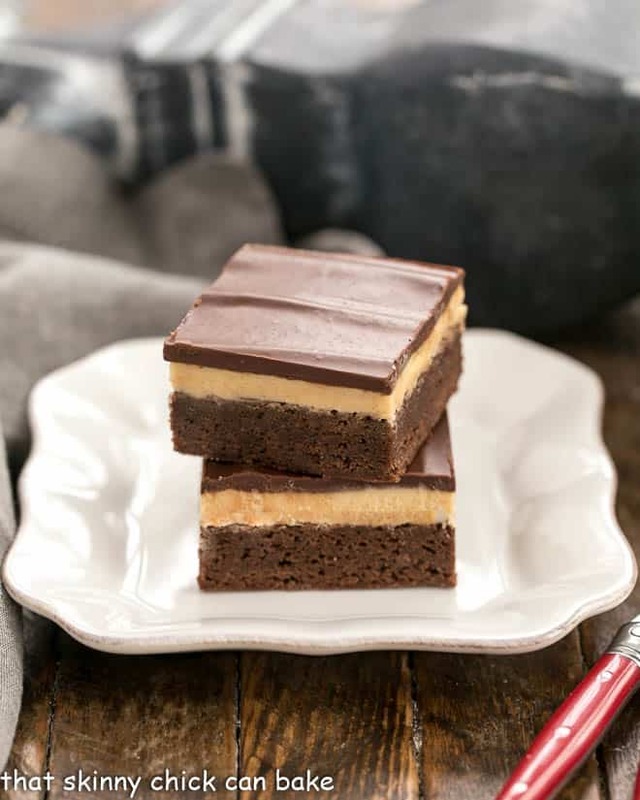 This is sure to be a crowd pleaser! Just beautiful, Liz! I love the pretty mixed berries! 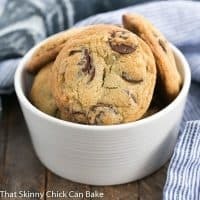 This recipe is so easy to customize and I look forward to diving right in! I missed the opportunity to freeze berries over the summer but thankfully, I can find nice ones at my grocery store. 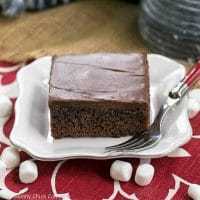 A slice of this on a cold day like this would be perfect.